Feeders can make excellent gifts. Be sure to also include a bag of sunflower seed with a gift of a feeder. Looking for some last-minute, bird-related gift ideas for the holiday season? This week’s column is dedicated to some suggestions just perfect for the serious birder or casual bird enthusiast on your Christmas shopping list. Do you have younger children on your shopping list? I would like to endorse a sweet, good-natured book about a gentle and engaging bird looking to win a contest for best bird song. “Bird Song,” a beautifully illustrated book aimed at children 6 to 12 (but a good read for adults too), is about a young scissor-tailed flycatcher bird by the name of Knocker. Despite some obstacles, including a lazy eye and a crooked wing that makes flying impossible, Knocker sets forth on his dream to represent Oklahoma in a national bird song contest. The book is charming, offers a great moral message, and comes illustrated with wonderful drawings. 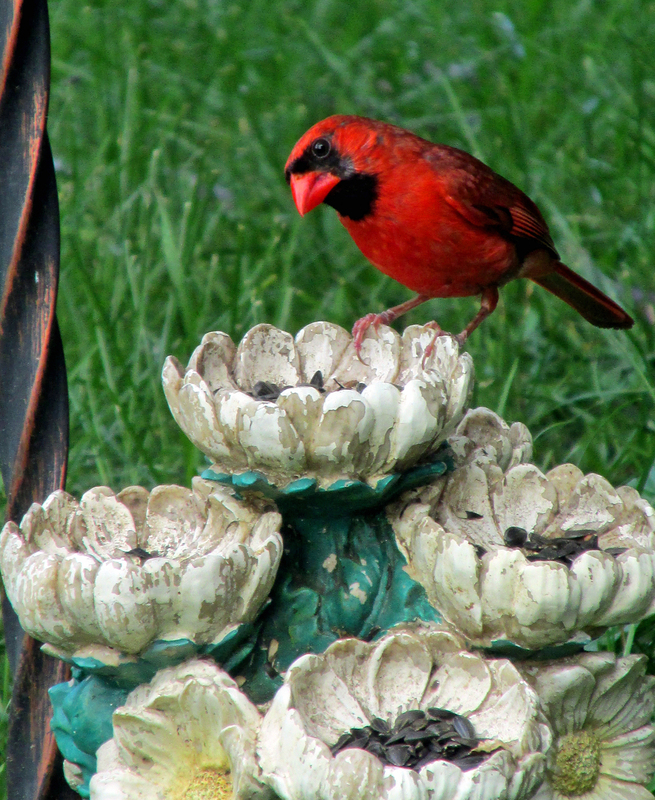 Knocker, the main character, meets an assortment of other feathered folk — cardinals, eagles, turkeys and many more — during his travels. Overall, there’s a lesson here on the value of perseverance, even in the face of disappointments and setbacks, that is conveyed with a light touch. Stephen Wright, a Facebook friend from England, is the author of this adorable book. I’ve also found it fascinating that a British author has compiled so much accurate information about so many American birds. 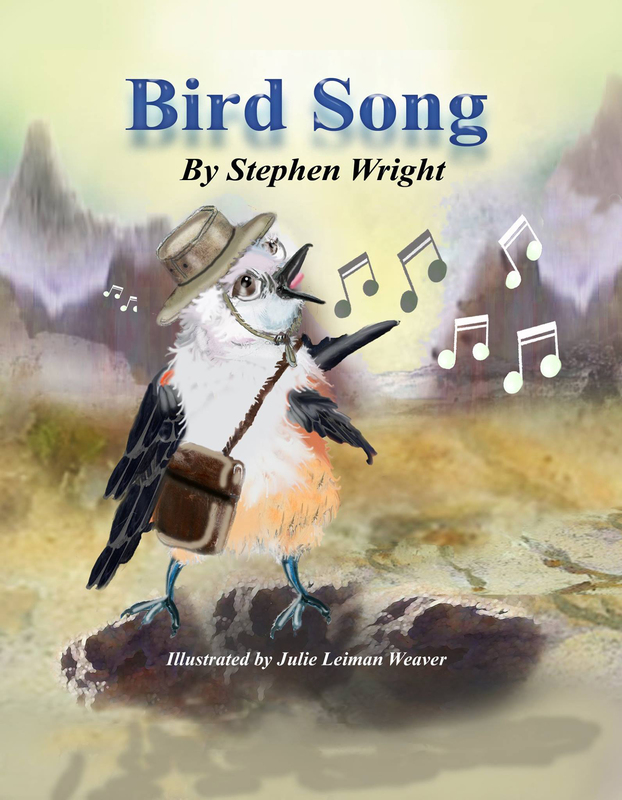 “Bird Song” is available on Amazon.com for $12.99. Send email to ahoodedwarbler@aol.com for details on purchasing a calendar. 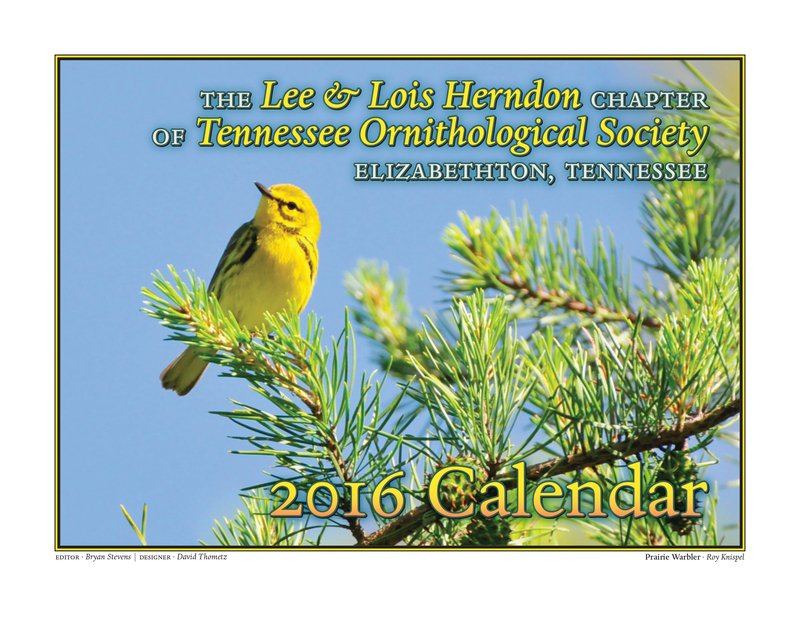 The Lee and Lois Herndon Chapter of Tennessee Ornithological Society produces an annual calendar featuring some exceptional bird photography from its members. This year’s calendar features full-color photographs of some of the region’s most colorful and engaging birds. The club sells the calendars for $15 each. All proceeds are used to support birding opportunities and bird-related causes. For instance, the club pays for bird seed to stock the feeders at Sycamore Shoals State Historic Park in Elizabethton, Tennessee. The club also regularly supports causes that benefit birds. The calendar also features an informative calendar grid with highlights for major holidays, as well as important bird-related dates. The calendar’s pages feature more than 80 full-color photographs of area birds, including common favorites and some not-so-common visitors. The front cover features a dazzling photograph of a bright yellow prairie warbler perched on a pine branch. If you’re interested in obtaining a calendar, contact ahoodedwarbler@aol.com by email. Do you have a friend or relative who isn’t able to get out of their home as often as they might like? Why not purchase them a small feeder they can hang near a window to enjoy the daily parade of birds that will flock to an offering of bird seed this winter season? Be sure that your gift of a feeder comes with a bag of sunflower seed so the recipient can immediately begin to enjoy the parade of birds sure to flock to the feeder. It’s never too early to start thinking about spring and the return of many of our favorite birds. To encourage more birds in our lives, it doesn’t hurt to encourage them by providing man-made nesting and roosting boxes. Many of our favorite birds — Eastern bluebird, tree swallow, Carolina chickadee, white-breasted nuthatch — will raise their young in nesting boxes. With boxes customized to their own particular needs, other birds such as Eastern screech-owl, wood duck and great crested flycatcher, will also make use of bird boxes.Many gardening centers, produce stands, feed stores and other shopping outlets sell bird boxes of various designs, shapes and sizes. 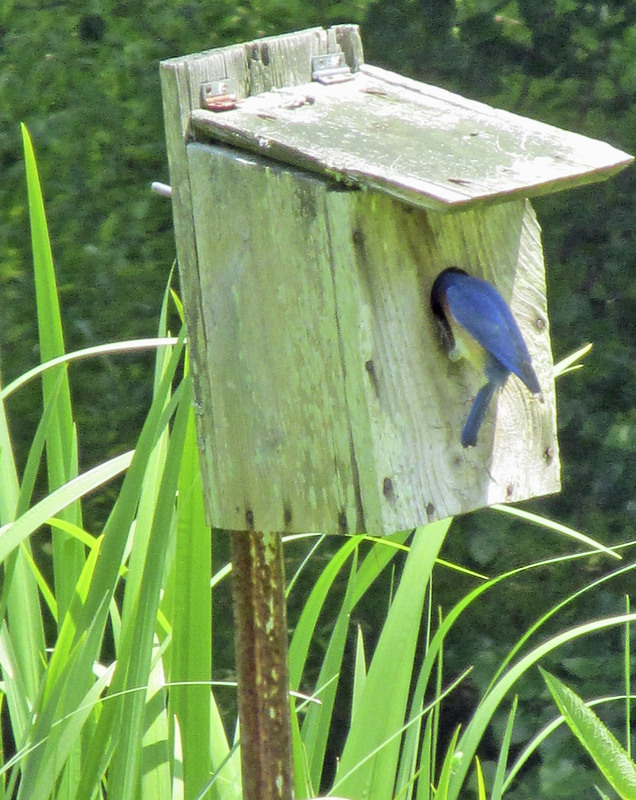 If you’re shopping for a bluebird box, be certain that the recipient’s yard is a spacious one. Bluebirds feel more comfortable in open surroundings. There are lots of other bird-related ideas. The list could include heavy-duty clothing for people who like to get outdoors to look for birds, figurines for the collectors on your list, or even a donation in someone’s name to a birding organizations like the National Audubon Society. I always like to choose a gift that will benefit both the birds and the recipient of the gift. This entry was posted in Birding, Birds on December 19, 2015 by Bryan Stevens. Birders learn fairly quickly that sometimes you just have to trust your eyes. Residents near Middlebrook Lake in Bristol, Tennessee, might have been understandably surprised in the days leading up to Thanksgiving when they spied a large white bird on the small lake in their neighborhood. All Photos by Bryan Stevens This American white pelican recently spent some time at Middlebrook Lake in Bristol, Tennessee. Alice Morgan, a resident of the Middlebrook subdivision, was certainly surprised. “We are lucky to have a view of the lake,” she said in an email she sent to me on Sunday, Nov. 29. The reference to a swan was made because of a small population of mute swans that have resided on the lake at least the past 20 years. 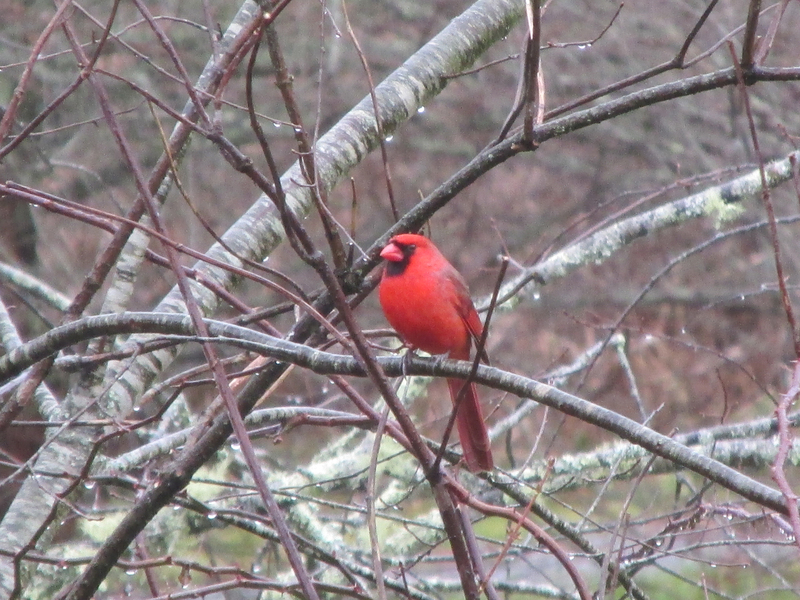 However, the bird that generated the recent excitement among area birders and Middlebrook residents wasn’t a swan or even a Thanksgiving turkey. The bird was truly an American white pelican, a rare and accidental visitor in the region. 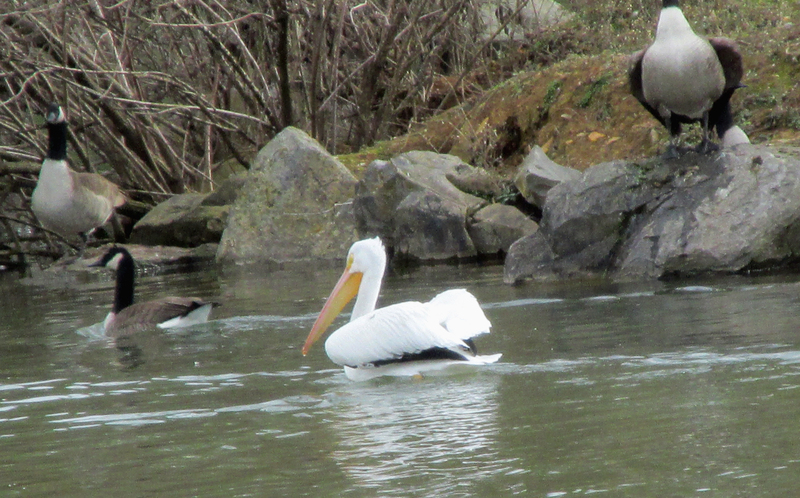 The pelican swam and associated with Canada geese at Middlebrook Lake. In addition to the email from Alice, one of my Facebook friends, Joanne Campbell, tipped me off to the pelican’s presence. I responded to Alice’s email and Joanne’s Facebook post, informing them that their identifications were absolutely correct. Regarding whether the bird was “lost,” I am not sure of the answer. Middlebrook Lake most likely looked like a favorable location for a migrating pelican to stop in order to refuel and refresh itself. 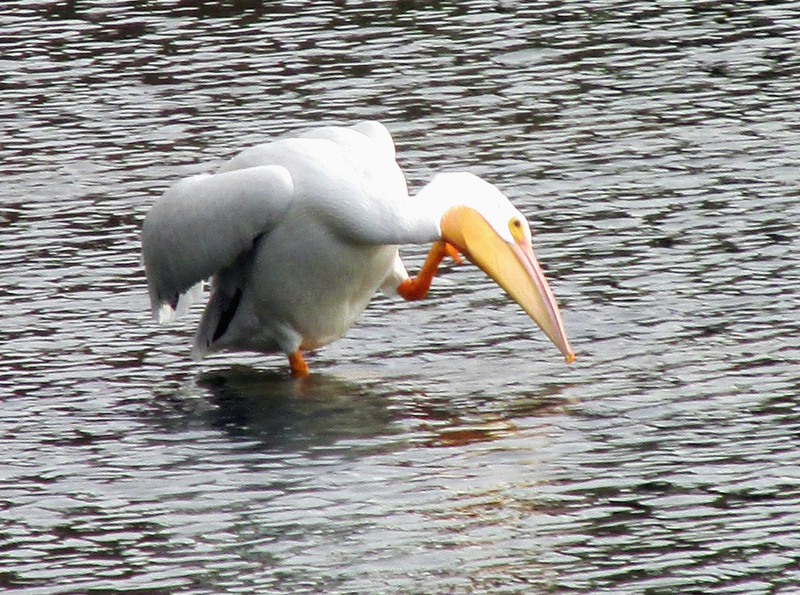 The pelican scratches at an itch. Bristol resident Wallace Coffey made the first report of the American White Pelican on Tuesday, Nov. 24. His post on Bristol-Birds, an online forum for sharing regional bird sightings, brought my mom and me to Middlebrook Lake the next afternoon. It didn’t take long to locate the large white bird sharing the lake with large numbers of Canada geese, American coots and hooded mergansers. The pelican sort of stuck out like a proverbial sore thumb. 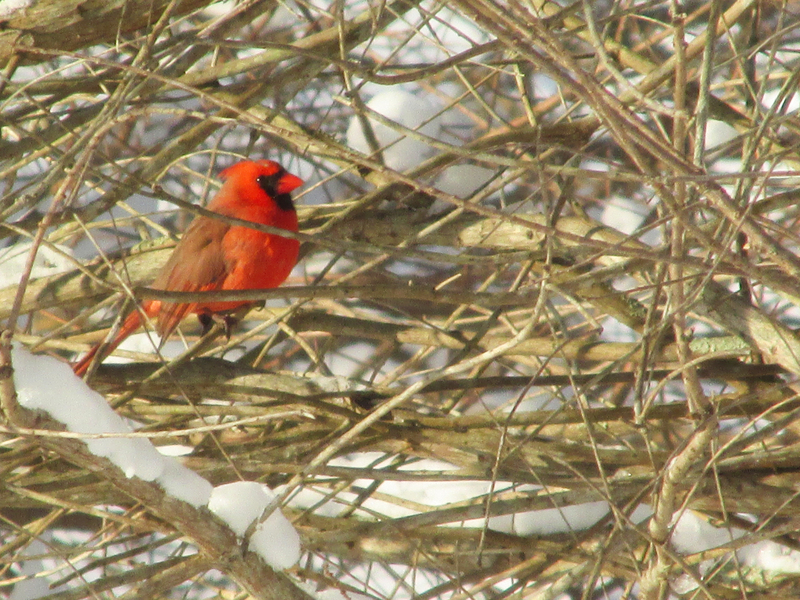 It didn’t seem wary of people, but I remained in my car and still managed to get decent photographs of the bird. While my mom and I watched the pelican, it swam among the Canada geese and coots on the lake. It also took time to preen its feathers and flap its wings. The American white pelican certainly turned some heads during its brief stay at Middlebrook Lake. The American White Pelican makes its home on large freshwater lakes and reservoirs across the prairie states — North Dakota, South Dakota, Nebraska, Kansas, Oklahoma, Montana and a few others — as well as the prairie provinces of Canada. They can be found along the Pacific and Gulf coasts during the winter, and as far inland as southern Minnesota and Wisconsin during the summer. By contrast, the smaller brown pelican generally does not leave coastal areas unless driven inland by hurricanes or other major storms. Populations of American white pelicans residing east of the Rocky Mountains migrate along river valleys, including the Mississippi River, to their wintering grounds along the Gulf Coast and in Mexico. It is not unusual for a few to stray into the eastern United States. American white pelicans are social birds and prefer to travel in flocks, although some of the reported observations in the region have involved solitary birds. 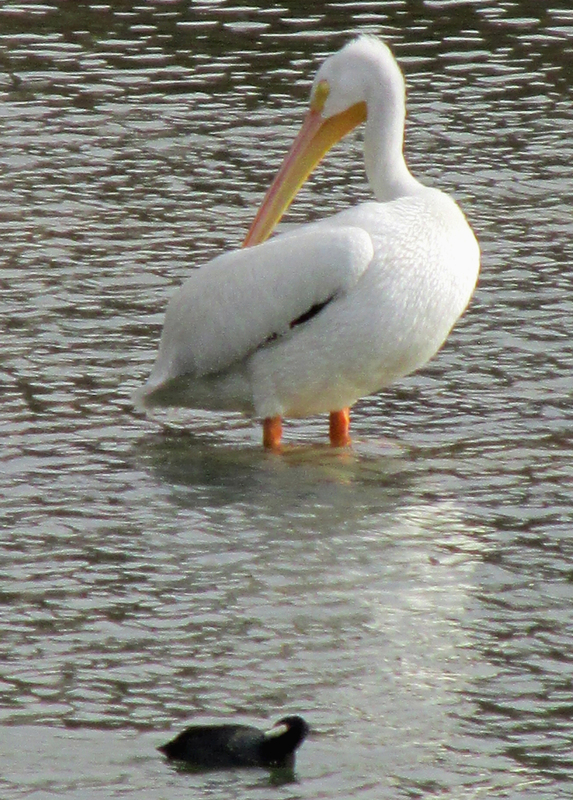 The pelican at Middlebrook Lake represents the first sighting of an American white pelican in Bristol since May of 2010. At that time, a flock of seven of these large birds was reported at Musick’s Campground on South Holston Lake. Because the lake straddles the Virginia/Tennessee line, members of that flock of pelicans were observed in both Sullivan County, Tennessee, and Washington County, Virginia. There was also a sighting made by Patty Elton of three American white pelicans in Wythe County, Virginia, in May of 2014. 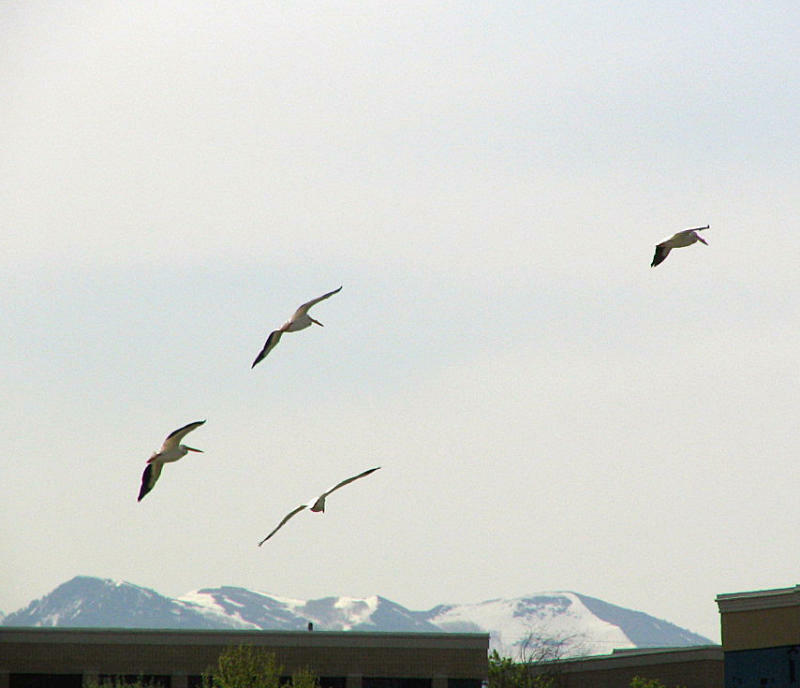 A flock of American white pelicans soars over Salt Lake City Utah in May of 2006. In his book, “The Birds of Northeast Tennessee,” Rick Knight lists only five records of American white pelican sightings. The first-ever sighting in Northeast Tennessee took place on Nov. 3, 1981, at Austin Springs on Boone Lake. That observation, reported by Glen Eller and Harry Farthing, involved a single pelican. 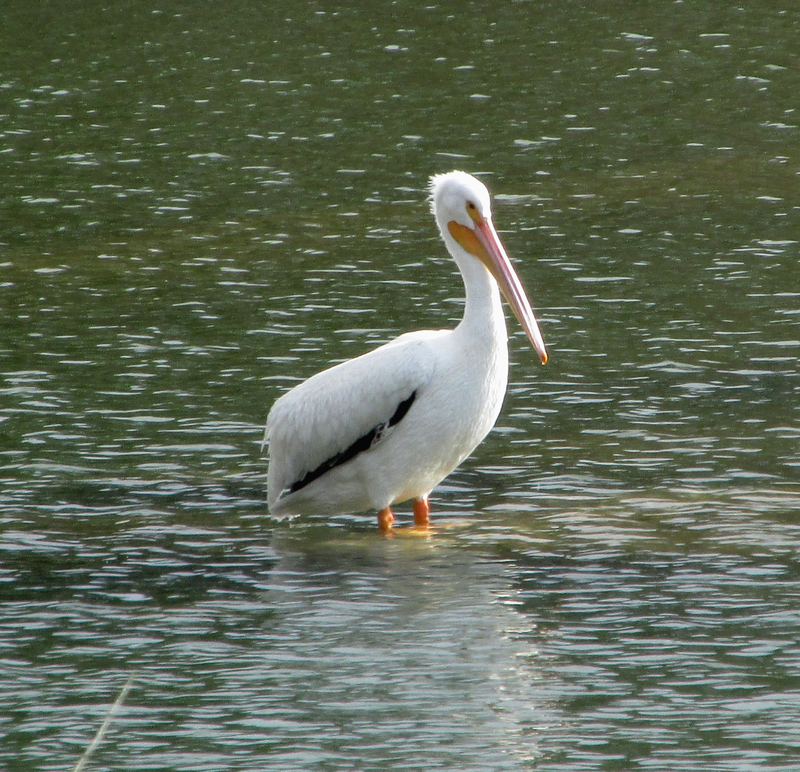 Another ten years passed before another solitary pelican visited Boone Lake and South Holston Lake in December of 1991. One of the best-known sightings took place in February of 1995 when a single American white pelican took up residence at a small pond on the grounds of Mountain Home Veterans Affairs in Johnson City, Tennessee. After spending time at that pond, that pelican moved to nearby Austin Springs on Boone Lake and later the Holston River in Kingsport. Unfortunately, the pelican collided with power lines in the summer of 1996 while flying. It injured a wing, which had to be amputated by a wildlife rehabilitation expert to save the bird’s life. Since the pelican at that point was no longer able to survive in the wild, it was sent to a zoo in Bridgetown, New Jersey. A flock of American white pelicans fly over the surf at Huntington Beach State Park, South Carolina, in March of 2015. Two years later, on April 8, 2006, Coffey and Knight reported four American white pelicans at Spring Creek, which runs into South Holston Lake. After that observation, this large bird didn’t make another regional appearance until the 2010 sighting of the seven-member flock at Musick’s Campground mentioned earlier. 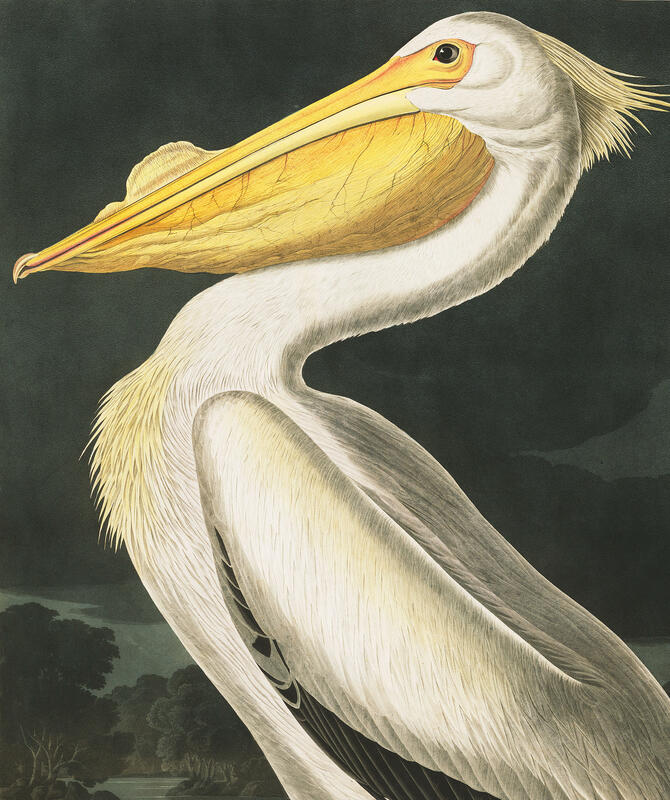 Early naturalist John James Audubon captured the American white pelican in its rather bizarre, ungainly glory. So, evidently, American white pelicans do migrate through the region in basically every season of the year. 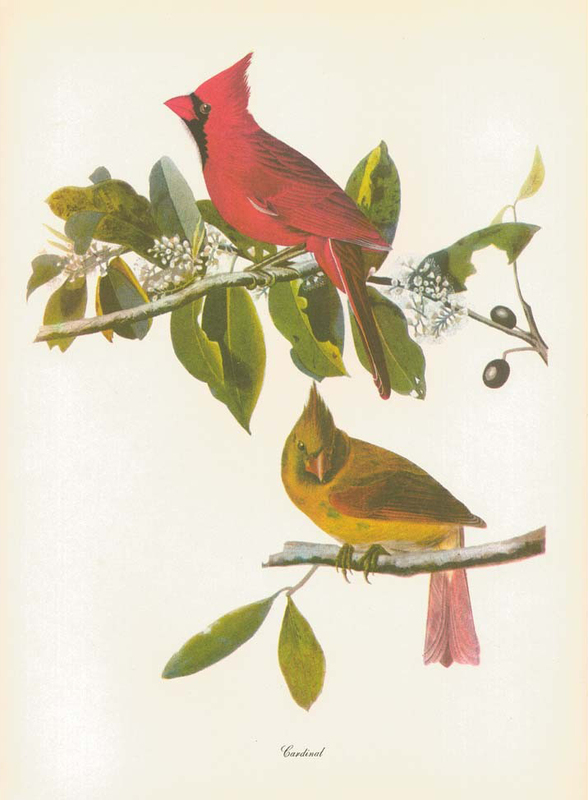 They are not, however, among birds one might expect to see in Northeast Tennessee or Southwest Virginia. I’m not surprised that the pelican selected Middlebrook Lake for its stopover. I’ve seen many unusual birds at this small lake over the years, including species such as common merganser, long-tailed duck, common goldeneye and tundra swan. The American white pelican is one of North America’s largest birds. This pelican’s wingspan can span nine feet compared to the six- to eight-foot wingspan of its much smaller relative, the brown pelican. While the brown pelican dives into the water to capture fish, the American white pelican feeds while floating on the water’s surface. Flocks of American white pelicans will work cooperatively to corral and capture fish. Worldwide, there are only eight species of pelicans. Some of the others include the great white pelican of southeastern Europe, Asia and Africa, as well as the pink-backed pelican of Arabia, Africa and southern India. Pelicans, like most of our birds, have wings and are capable of long-distance flight. You never know what you might see. Keep your eyes open and a pair of binoculars handy. This entry was posted in American white pelican, Birding, Birds, Middlebrook Lake, Pelicans, Tennessee and tagged American white pelican, Birding, birds, Bristol Herald Courier, Carter County Compass, Elizabethton Star, Erwin Record, Feathered Friends, McDowell News, Our Fine Feathered Friends, Pelicans, The Erwin Record on December 13, 2015 by Bryan Stevens. 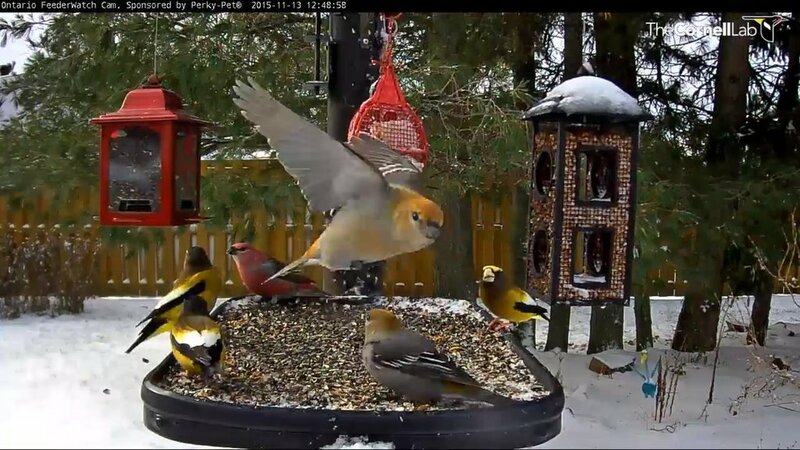 A still shot from the Feeder Watch cam in Ontario showing Evening Grosbeaks and Pine Grosbeaks. 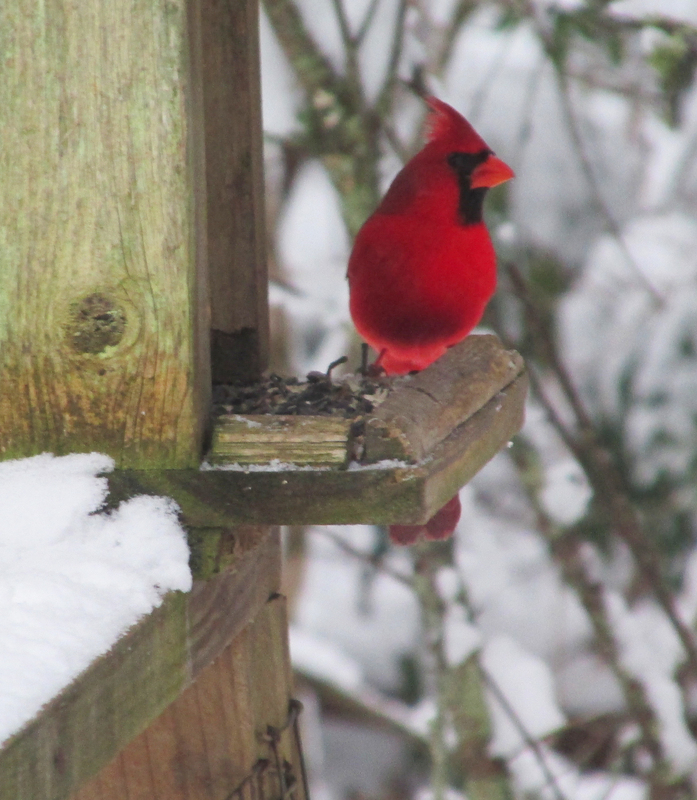 Patricia Werth, a resident of Abingdon, Virginia, shared with me in an email that that she has been enjoying watching birds visit feeders for snacks of sunflower seeds and other tidbits. The feeders, however, are not her own. She has been watching online a camera focused on a family’s backyard feeders in Ontario, Canada. A couple named Tammie and Ben Haché are identified on the webpage as the hosts for the camera. She informed me that the Cornell Laboratory of Ornithology placed the camera on the feeders. In similar projects, Cornell has also placed bird cams in positions that allow different moments of a bird’s life — such as hatching and fledging —to be shared with onlookers watching from the comfort of their living rooms or with the convenience of a smart phone. 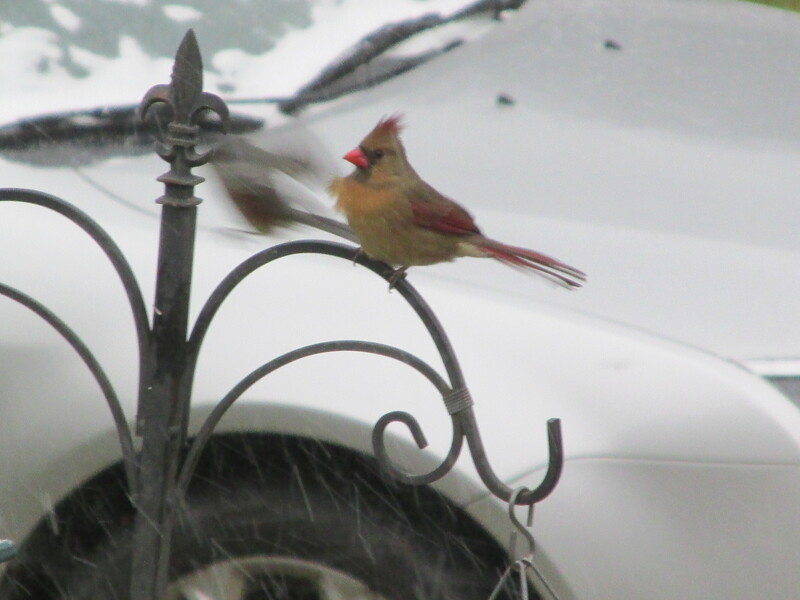 “They have a flat tray as one of their feeders with shelled peanuts and sunflower seeds on it,” Patricia shared. 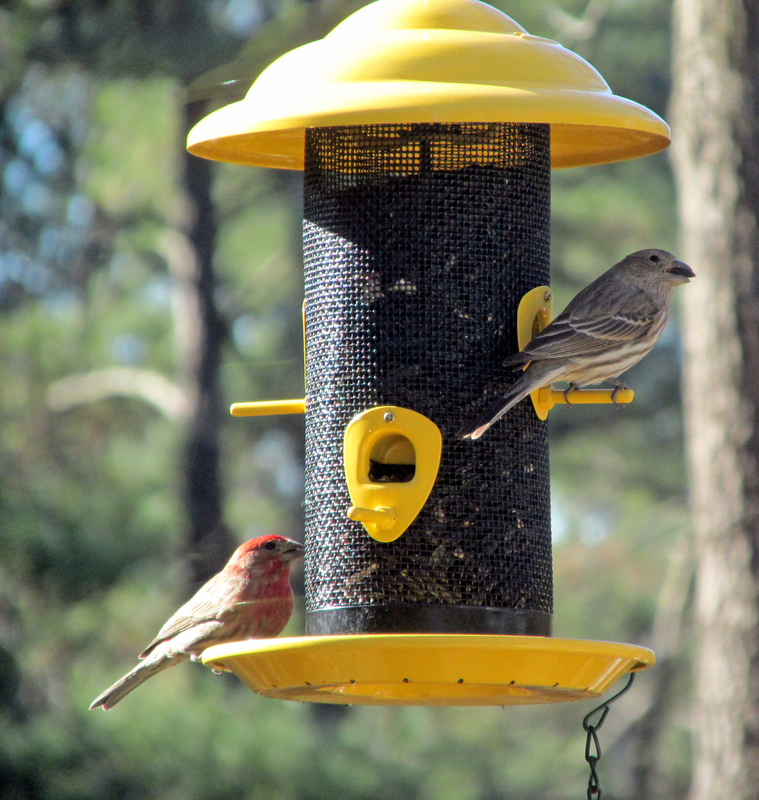 A pair of House Finches visit a feeder. She noted that some of the birds at the feeders include a ruffed grouse. While the grouse was eating, a blue jay arrived and wanted the grouse to leave. In response, the grouse ruffled its neck feathers and spread its tail. 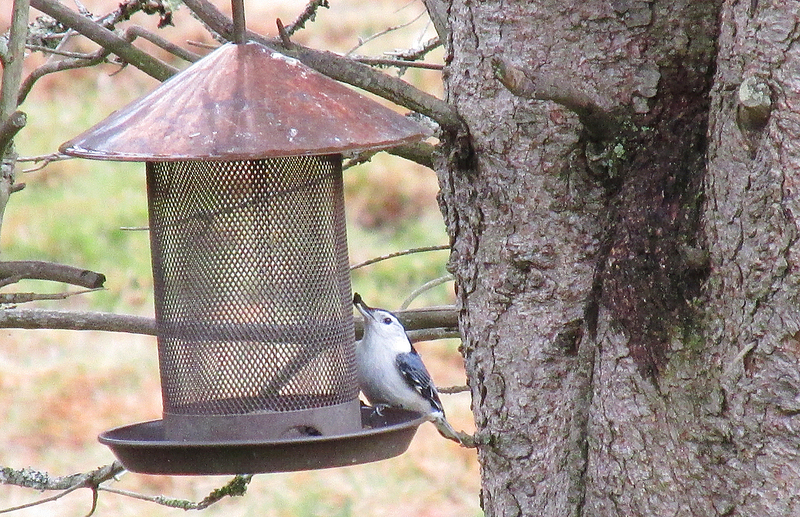 “The blue jay decided to wait to eat,” she added. Patricia has also enjoyed the habits of the crows and blue jays at the feeders, noting that a jay will pick up one shelled peanut and fly away but the crows won’t leave until they have at least three peanuts. “Fun stuff to watch,” she said. Patricia has seen many species that don’t often reach Virginia and Tennessee, including birds like evening grosbeak and pine grosbeak. Patricia had also read my recent column on dark-eyed juncos. 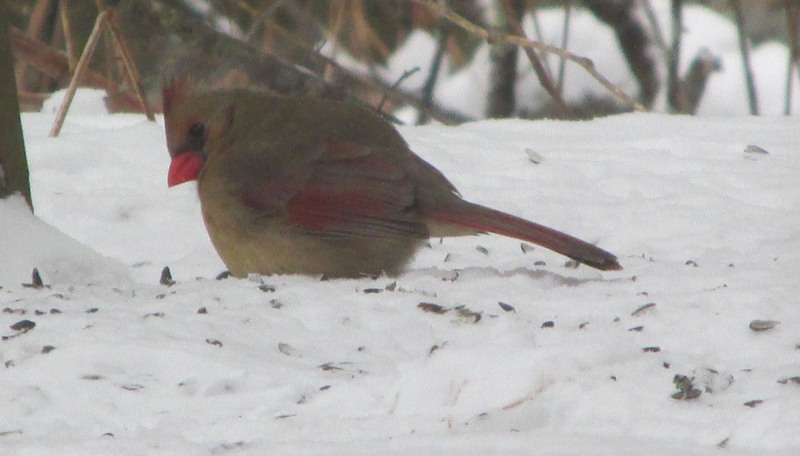 “I still haven’t seen any juncos yet, but I have been watching for them,” she shared. 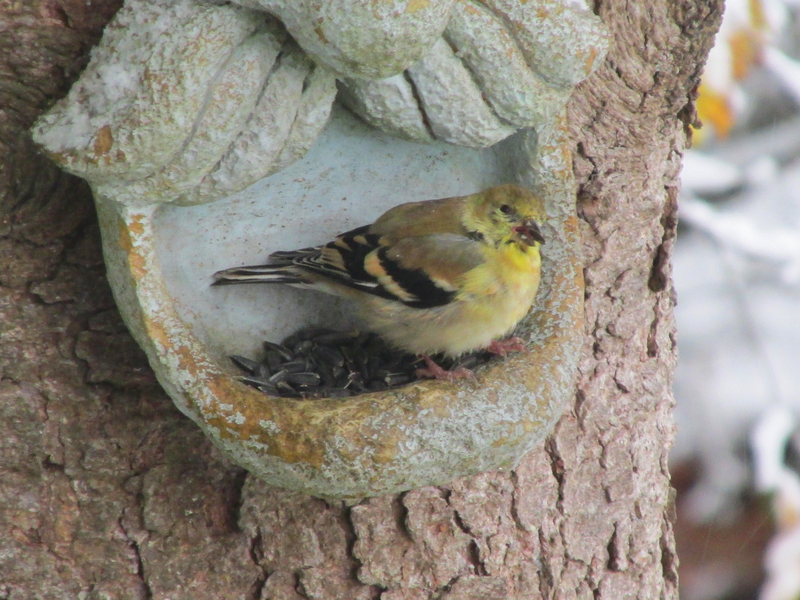 American Goldfinch eating sunflower seeds at a feeder. It’s simple and relatively inexpensive to feed the birds. While a wide range of feeders of all shapes and sizes can be purchased at gardening centers and most retail stores, something as simple as a clay saucer can function as a dispenser of seeds. Of course, seeds can even be scattered on the ground. In fact, this is the preferred method of foraging for many of our ground-dwelling birds. I like to provide a mixed variety of foods during the winter months. My main offering include black oil sunflower seeds (and plenty of them), as well as suet cakes and shelled, unsalted peanuts. Some of our more common feeder visitors include Carolina chickadees, tufted titmice, blue jays, house finches, American goldfinches, as well as a variety of sparrows and woodpeckers. It’s still fairly early in the winter season, but it’s good to watch for more unexpected visitors such as purple finches, red-breasted nuthatches and evening grosbeaks. 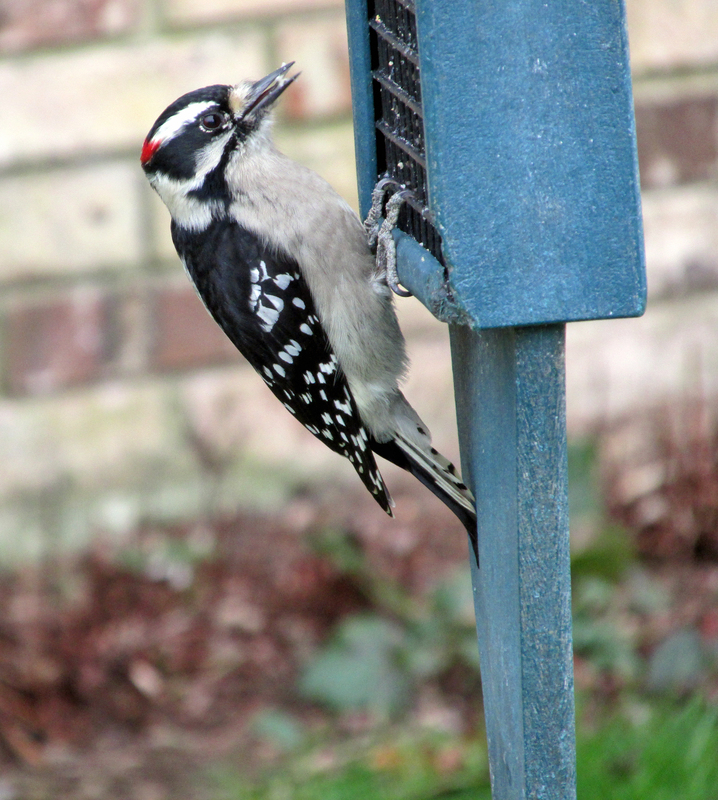 Downy Woodpecker obtains suet from a feeder. In urban or suburban settings, expect to entertain such birds as house sparrows, European starlings and rock pigeons at your feeders. These non-native species can quickly overwhelm some feeders and crowd out native birds. Whether or not the show is televised, it’s always great fun to watch the antics of birds at our feeders during the winter months. Many of the other aspects of the natural world that we enjoy, from flowers and butterflies to gardening and dragonflies, are absent during the winter months. Curious chickadees, feisty finches and wily wrens can definitely lift one’s spirits on gloomy winter days. 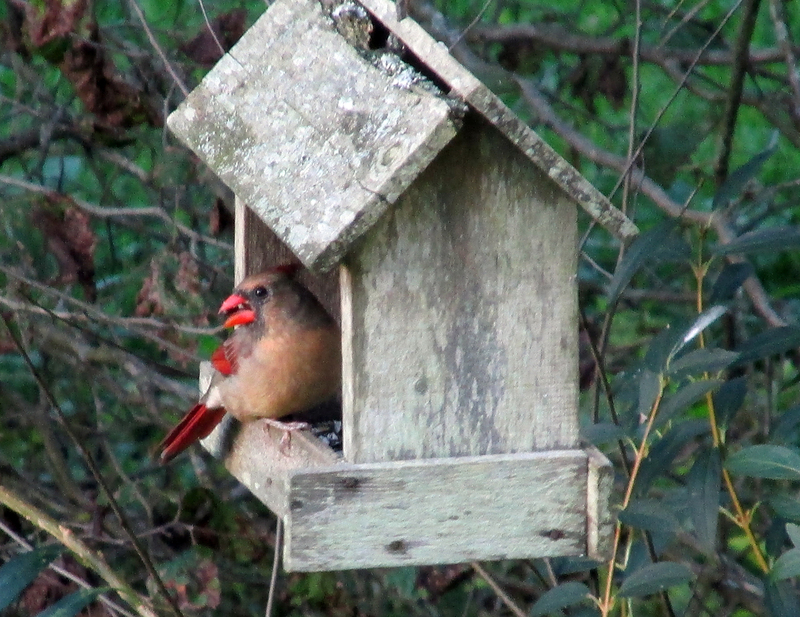 A female Northern Cardinal perches on the side of a rustic feeder. 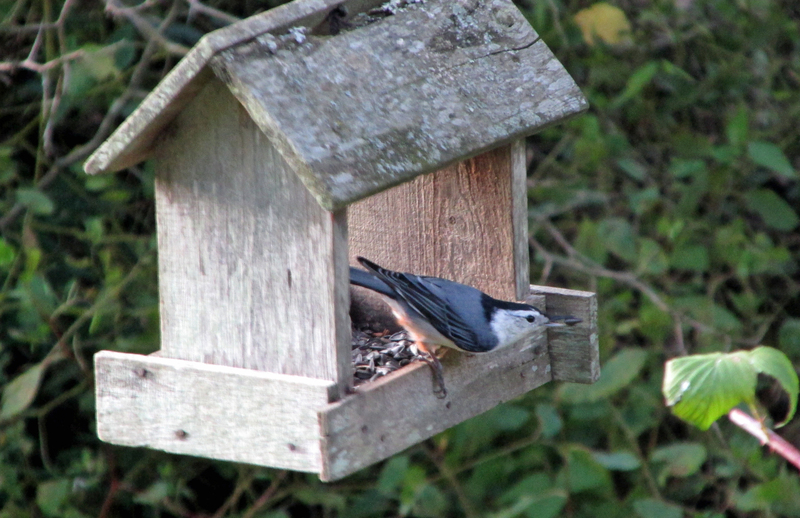 A White-breasted Nuthatch departs a feeder with a seed. 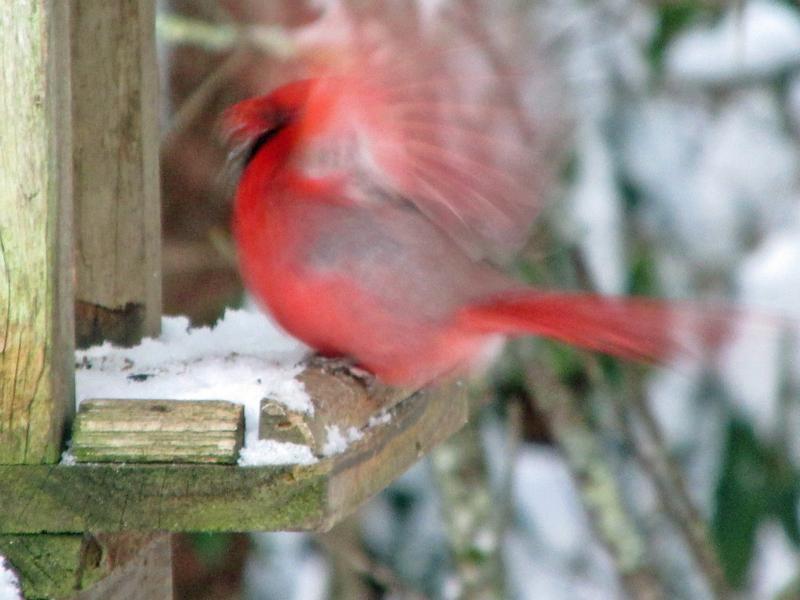 This entry was posted in Birding, Birds, Bryan Stevens Feathered Friends, Cardinal, Feeding birds and tagged Birding, birds, Bristol Herald Courier, Carter County Compass, Elizabethton Star, Erwin Record, Feathered Friends, Feeding birds, McDowell News, Our Fine Feathered Friends, The Erwin Record, Winter birds on December 6, 2015 by Bryan Stevens.